LHL Holdings is expected to invest $40 million to convert the mill into residential units. BIDDEFORD — Financing finally has been secured for the Lincoln Mill project in Biddeford after years of uncertainty and missed deadlines, with permits anticipated to be pulled within the next 60 days. 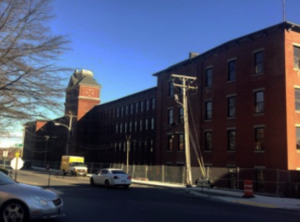 The project was originally proposed in 2014 and LHL Holdings LLC – formerly known as Atlantic Holdings LLC – filed a joint development agreement in September 2017 with Biddeford to develop the Lincoln Mill. The agreement details conditions of the project, in which the renovation of the mill was to be done in conjunction with the now-completed road improvements to both Lincoln and Main streets. Per the agreement, LHL Holdings is expected to invest $40 million in the project, which originally envisioned an 80-room boutique hotel. The current plans call for a strictly residential development. The project was granted a 99-year lease to surrounding parking based on the plan to include a hotel on the premises, which will remain despite the change of plan. According to the joint development agreement, there were three deadlines mandated by the city for the project to pull the necessary permits to begin development. While City Manager James Bennett said in April 2018 that permits were expected to be pulled by May 29, 2018, developers have since missed the three subsequent deadlines. The first, Aug. 29, 2018, incurred a $5,000 fine. After second deadline passed on Nov. 29, 2018, developers incurred a $10,000 fine. Code Enforcement Director Roby Fecteau confirmed that the most recent deadline was missed on March 11. However, Fecteau said a demolition permit was pulled by LHL Holdings the first week of March. The missed deadline was accompanied by a fine of $15,000, bringing the total of fines – to be used for downtown development – to $30,000. According to Bennett, these fines will be paid to the city before the developer can file for occupancy permits for the mill project. Bennett has remained positive throughout the last year, confirming with each missed deadline that developers had been in contact with the city, keeping all parties involved abreast of the challenges of obtaining financing for the project. In a March 18 email, Bennett confirmed that LHL has secured necessary financing to move forward with the project, and is expected to pull the necessary permits in the next 60 days. Costs of the permits to begin construction will be determined when the code enforcement officer receives finalized plans. They will be based on the final building valuation, calculated at the rate of $14.35 per $1,000 of valuation, in addition to a $60 filing fee. In the March 18 email, Bennett confirmed that developers had begun working on the logistics of construction for the project, including traffic and parking for construction workers. LHL Holdings, helmed by Tim Harrington, was granted an extension via an amendment to the original joint development agreement in March 2018. LHL was forced to reassess and get a new property appraisal this fall after possible tax reform left its historic tax credit status unsure. The final version of the tax legislation signed on Dec. 22 by President Trump retained the 20 percent tax credit for buildings built before 1936, but requires the credit be taken over the course of five years. The prospect of losing the tax credit temporarily left the project in limbo, and by the time the credit was reinstated, the previous appraisal for the property was too old to secure financing. This required LHL to apply for the aforementioned extension while waiting for a new appraisal. The most recent appraisal values the property at $2.1 million. LHL Holdings, as Atlantic Holdings LLC, purchased the property on Jan. 16, 2015, for $2.5 million. Since amending the joint development agreement, Eric Chinburg of Chinburg Properties joined Harrington in the project. Chinburg has developed mills in the Biddeford/Saco downtown districts, having developed Saco Mill No. 4, where apartment leases range, according to the Chinburg Properties website, from $925 for a studio up to $1,895 for a two-bedroom unit. Chinburg wrote a letter to Mayor Alan Casavant on Aug. 30, 2018, following the missed Aug. 29 deadline, assuring him that the project was still moving forward. Bennett has confirmed that developers remain within the terms of the joint development agreement and stipulated in his email he has “complete confidence” that permits will be pulled in the next 60 days.